Brig. Gen. Irvin McDowell is assigned command of the Department of Northeastern Virginia and the military forces camped in and around Washington. McDowell’s military force, called the Army of Northeastern Virginia, is scheduled to march to Manassas Junction on this day, but a lack of sufficient supplies delays the movement. McDowell’s army begins its march toward Manassas Junction. By evening Brig. Gen. Daniel Tyler’s division has reached Vienna, Col. David Hunter’s and Col. Dixon S. Miles’ divisions have arrived at Annandale, and Col. Samuel P. Heintzelman’s division is at Pohick Creek. Commanding the Confederate Army of the Potomac at Manassas Junction, Brig. Gen. Pierre G. T. Beauregard informs the Confederate War Department of McDowell’s advance and asks for reinforcements. Confederate authorities order the independent brigade of Brig. Gen. Theophilus H. Holmes at Fredericksburg to reinforce Beauregard. In Richmond Col. Wade Hampton’s independent Hampton Legion is also ordered to Manassas Junction. At Leesburg the 8th Virginia Infantry of Col. Philip St. George Cocke’s brigade is ordered to Manassas Junction. 1130: The head of McDowell’s army, Tyler’s division, reaches Fairfax Courthouse. 1100: Tyler’s division arrives at Centreville. Tyler moves a portion of Col. Israel B. Richardson’s brigade south of Centreville and instigates a lively skirmish in what becomes known as the Battle of Blackburn’s Ford. 1200: Johnston’s Army of the Shenandoah departs Winchester for Manassas Junction. Hunter’s and Miles’ divisions arrive near Fairfax Courthouse, and Heintzelman’s division near Sangster’s Station (near what is now Clifton). Unaware of Tyler’s skirmish at Blackburn’s Ford, McDowell personally reconnoiters the area around Sangster’s Station, searching for a location to turn the Confederate right flank. In the evening Brig. Gen. Thomas J. Jackson’s brigade, leading Johnston’s army, camps near Paris, Virginia, seventeen miles from Winchester, while the remainder of the army halts along the Shenandoah River. Although the skirmish at Blackburn’s Ford provided McDowell with intelligence about Confederate positions and strength, he fears the skirmish has caused the Confederates to reinforce their right flank. McDowell orders his engineers to reconnoiter north of the Stone Bridge, on the Confederate left. 0900: After arriving at Piedmont Station, Jackson’s brigade departs for Manassas Junction. 1500: Col. Francis S. Bartow’s brigade departs Piedmont Station for Manassas Junction. Johnston directs his cavalry and artillery to continue to Manassas Junction by road. 0700: Johnston boards a train for Manassas Junction, along with Brig. Gen. Barnard E. Bee and portions of Bee’s brigade. Brig. Gen. E. Kirby Smith remains at Piedmont Station to expedite the transportation of the remainder of Johnston’s army. 1200: Johnston and Bee arrive at Manassas Junction. After Johnston suggests an attack against McDowell’s army, Beauregard proposes to attack the Union left flank at Centreville. Johnston requests that Beauregard put the plan in writing. Hunter’s, Heintzelman’s, and Miles’ divisions arrive at Centreville. Brig. Gen. Theodore Runyon’s division guards the railroad from Alexandria. McDowell’s engineers discover the undefended Sudley Ford and Poplar Ford, north of the Stone Bridge. McDowell plans an attack for the following day. 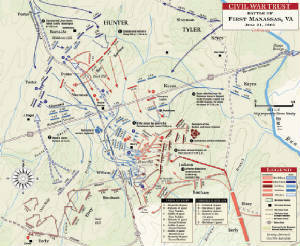 Hunter’s and Heintzelman’s divisions will march around the Confederate left, crossing at Sudley and Poplar fords, while other troops create diversions at the Stone Bridge and Blackburn’s Ford. 0230: McDowell’s army begins its march against Beauregard. Tyler’s division (with the exception of Richardson’s brigade), followed by Hunter’s and Heintzelman’s divisions, march west on the Warrenton Turnpike. Richardson’s brigade, along with Col. Thomas A. Davies’ brigade of Miles’ division, moves toward Blackburn’s Ford. Col. Louis Blenker’s brigade of Miles’ division remains at Centreville in reserve. Beauregard submits his plan to attack the Union left flank at Centreville to Johnston, who approves it. 0530: Tyler’s division clears the Cub Run Bridge and Hunter’s and Heintzelman’s divisions follow. After crossing Cub Run, Hunter and Heintzelman turn north from the turnpike toward Sudley and Poplar fords. 0600: Tyler arrives in front of Stone Bridge and opens fire with his 30- pounder rifle on Col. Nathan G. Evans’ brigade. 0700: Concerned about the artillery fire near the Stone Bridge, Johnston orders Bee, Bartow, and Jackson to move closer to the Confederate left to be able to provide support if needed. Beauregard also sends the newly arrived Hampton Legion to the left. 0800: Johnston and Beauregard place themselves on a hill to the rear of Brig. Gen. Milledge L. Bonham’s brigade in anticipation of Beauregard’s flank attack. 0830: Signal officer Capt. E. Porter Alexander discovers the Union column marching toward Sudley Ford to outflank the Confederate left and reports the movement to Evans and Johnston. Evans moves the bulk of his command from the Stone Bridge to Matthews’ Hill to block the Union flank march. Although Johnston is apprehensive that the Union troops reported north of the Stone Bridge may be those of Patterson’s army arriving from the Shenandoah Valley, he continues with the plan to attack Centreville. 0930: Hunter’s division arrives at Sudley Ford. After a short delay the column crosses Bull Run and continues south. Instead of crossing at Poplar Ford, Heintzelman’s division follows Hunter’s division. 1030: The head of Hunter’s column, Col. Ambrose E. Burnside’s brigade, engages Evans’ command on Matthews’ Hill. 1100: As the firing increases on the Confederate left, Johnston and Beauregard ride toward Henry Hill. Col. Andrew Porter’s brigade of Hunter’s division arrives on Matthews’ Hill, moving onto nearby Dogan Ridge. Capt. Charles Griffin’s and Capt. James D. Ricketts’ batteries arrive on Dogan Ridge. The brigades of Bee and Bartow (with Bee in command of both units) arrive on Henry Hill and shortly thereafter both brigades move to Matthews’ Hill to support Evans. 1130: Col. William T. Sherman’s and Col. Erasmus Keyes’ brigades of Tyler’s division cross Bull Run, just north of the Stone Bridge. Sherman continues toward Matthews’ Hill, Keyes, accompanied by Tyler, moves to Young’s Branch, east of the Stone house. Col. William B. Franklin’s and Col. Orlando B. Willcox’s brigades of Heintzelman’s division arrive on Matthews’ Hill. Col. Oliver O. Howard’s brigade is close behind. Outflanked, Evans, Bee, and Bartow are forced to withdraw from Matthews’ Hill and fall back to Henry Hill. The Hampton Legion arrives near the Robinson house on Henry Hill. Hearing the increased firing coming from the left flank, Johnston scraps Beauregard’s attack plan and rides toward Henry Hill. Beauregard follows. 1200: Jackson’s brigade arrives on Henry Hill. Johnston and Beauregard arrive on Henry Hill. 1300: Keyes is ordered to attack Henry Hill near the Robinson house. He sends two of his four regiments forward, but they are driven back. Keyes’ entire brigade withdraws to the vicinity of the Stone Bridge. 1400: Griffin’s and Ricketts’ batteries move from Dogan Ridge to Henry Hill. Griffin unlimbers north of the Henry house and Ricketts south of the house. 1430: Griffin moves two guns of his battery to the right of Ricketts, where the 33d Virginia Infantry captures the guns. The remainder of Griffin’s battery withdraws from Henry Hill. The 14th Brooklyn recaptures Griffin’s two guns. The 4th and 27th Virginia Infantries, with assistance from the 49th Virginia Infantry, 6th North Carolina Infantry, and two companies of the 2d Mississippi Infantry, capture Ricketts’ battery and Griffin’s two guns. The 1st Michigan Infantry attempts and fails to recapture Ricketts’ guns. The 11th Massachusetts Infantry recaptures Ricketts’ battery, and the 4th and 27th Virginia Infantries fall back to their former positions. The 5th Virginia Infantry, Hampton Legion, 4th Alabama Infantry, and 7th Georgia Infantry recapture Ricketts’ guns. Bee is mortally wounded and Bartow is killed. Ricketts is wounded and captured. The 11th Massachusetts Infantry falls back to the Manassas-Sudley Road. 1500: Sherman’s brigade begins an attack against Henry Hill, and Howard’s brigade moves to Chinn Ridge. The 13th New York Infantry skirmishes with the Hampton Legion around the Henry house. The 2d Wisconsin Infantry unsuccessfully assaults Henry Hill. The 79th New York Infantry unsuccessfully assaults Henry Hill. The regiment commander, Col. James Cameron, brother of the Secretary of War, is killed. Sherman’s last regiment, the 69th New York Infantry, along with the 38th New York Infantry of Willcox’s brigade, assault Henry Hill and recapture Ricketts’ and Griffin’s guns. Col. Wade Hampton is severely wounded. The 18th Virginia Infantry of Cocke’s brigade, along with remnants of several other Confederate units on Henry Hill, recaptures the Union guns. Sherman’s and other Union units near Henry Hill withdraw to the Warrenton Turnpike. 1530: Two regiments of Howard’s brigade arrive on Chinn Ridge. Two other regiments remain in reserve near the Warrenton Turnpike. 1600: Col. Arnold Elzey’s and Col. Jubal A. Early’s brigades arrive on Chinn Ridge. General Smith briefly takes command of Elzey’s brigade but is wounded and Elzey resumes command. Howard brings forward his other two regiments to Chinn Ridge. With the assistance of 150 troopers of Col. J. E. B. Stuart’s cavalry, the brigades of Elzey and Early outflank Howard’s brigade and drive it back to the Warrenton Turnpike. 1700: Retreat of the Union Army begins.